Senator Traveres: What are you, some kind of Boy Scout? Danny O�Neill: Yeah, about to earn another merit badge. Pierce Brosnan has been blessed with terrific roles outside of the wildly successful James Bond franchise, and there is a very good reason for that. Very few actors offer the sort of intensity and cool that Brosnan effortlessly brings to each of his roles. From his early days on television's Remington Steele to his turn as the charming foil for Robin Williams in Mrs. Doubtfire, Brosnan has made each of the projects he involves himself with better in at least one way or another. Take, for instance, the 1992 film Live Wire, a preposterous thriller that stars Brosnan as a bomb expert on the trail of a super secret explosive that is nearly impossible to track. The first appearance of the bomb occurred in Washington D. C. when a senator exploded in a crowded restaurant for apparently no reason. Enter FBI bomb expert Danny O'Neill (Brosnan), a seasoned investigator who has fallen upon hard times since the death of his daughter in a backyard swimming pool. He and his wife Terry (Eilbacher) are clearly becoming more estranged by the day, considering her affair with Senator Traveres (Silver). As O'Neill searches for clues, it becomes evident that though there are no signs of an explosive the senator's death has to have been the work of a bomb. Ultimately it is seen that the bomb is a form of liquid identical in appearance to water that reacts when it reaches the stomach, causing the victim to explode. Though the plot is preposterous and leaves many holes open to discussion (if it is liquid, wouldn't people know that they were not drinking water?) there is something in the story that makes the film intriguing. Screenwriter Bart Baker devises some truly clever ways in which the bomb finds its way into the script, including a judge who explodes in her own courtroom, but overall the reasoning and motives of the lead villain are simply laughable. Somewhere along the way it is explained just why someone is trying to kill the senators, something to do with illegal arms trading and a supposed share of the money. It is always something, isn't it? Director Christian Duguay (The Art of War and, um�Extreme Ops) provides a very slick look to the film, and the action sequences have a very kinetic feel to them. It is only in the latter half of the film that the action becomes unnecessarily strange, as Live Wire turns from respectable action to sheer lunacy and unwanted melodrama. From O'Neill�s wife to the race to catch the killer, Live Wire loses whatever it had going for it in the last act. As I mentioned above, Brosnan is perhaps the best reason to see Live Wire, as his performance, while not exceptional, has the sort of energy needed for a film like this. In supporting roles, Silver and Eilbacher are laughably bad as the other sides of a cheesy love triangle. Image Transfer Review: Presented in not one but four different versions, those looking for every possible way to see Live Wire will no doubt jump for joy. First you have the widescreen unrated edition as well as a full frame counterpart. Next are the original R rated cuts in both widescreen and full frame transfers. I chose to review the unrated widescreen image and I was fairly pleased with the results. Sharpness and detail are each perfect with no softness to speak of while black levels are each done perfectly with no grain evident. I noticed no serious issues regarding edge enhancement of pixilation. Overall, this is a very good transfer. Audio Transfer Review: The Dolby Digital 5.1 track is a nicely designed mix that gets the job done. Dialogue is crisp, though there were several instances where I had to turn the center channel up to make it match the remaining channels. Surround use is limited to ambient sounds and explosions, while the .1 LFE track gets a decent workout. Extras Review: No extra features are offered, aside from the various versions of the film. 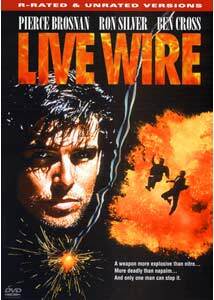 Live Wire does have some fans out there, and those who like the film will be happy with the recent release on DVD. I appreciate the film as pure fun and nothing more, and those looking into renting the disc should go into it with no expectations. I feel you may find yourself mildly entertained for an hour and a half.